As soon as I stepped outside the door with the dog last night, I knew it would be an interesting walk. The air looked foggy, that surreal mistiness that brings to mind bad old movies and similarly hackneyed old movie soundtracks. The cold, clammy, almost touchable scene seemed to be a character in and of itself. I'm not sure Frasier appreciated the moment - he was a little busy charging around the corner of the house as all of this was dawning on me - but already my mind was racing. I wanted to get a picture of it, but shooting at night is a challenging proposition at the best of times. Even if you have the right camera, a tripod, and all the time in the world, low-light shooting in variable conditions like we encountered on this particular night is a recipe for failure, a virtual guarantee that most, if not all, of what you bring back will be fodder for the recycling bin. 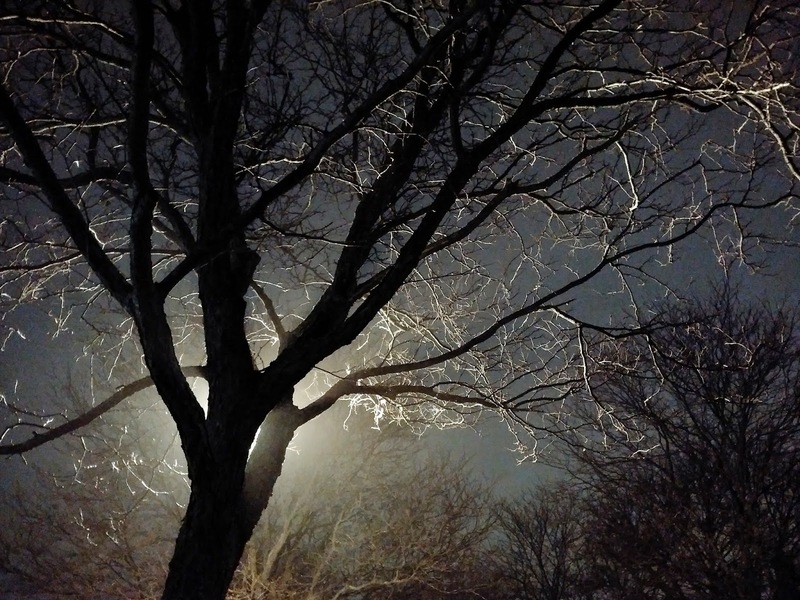 The trees seemed to beckon as I walked past and caught their silhouetted forms in the diffused light of the sodium vapor streetlamps. The trunks seemed an ominous as any I'd ever seen on old episodes of Scooby Doo, while the smaller branches on the extended canopies glinted in ways I had never seen before. Which was kind of odd given how many hundreds of times I've walked these very streets since we first brought Frasier home. Even now, the seemingly familiar landscape offered up something new. And as much as I tried to keep walking, that little voice in my head kept telling me I needed to record the moment in some way. So I used the camera that I had, my BlackBerry Passport, and tucked the leash as tightly under my arm as I could while I calmly begged our now-curious pup to sit quietly while I composed and shot. It wasn't easy - more than a few images blurred out as the little furry man decided to dig his nose into some nearby bushes or explore the magic of a parked car's front passenger-side tire - but in the end I think everything worked out. I'm guessing there will be more spontaneous smartphone shoots in my future. And I'm guessing Frasier will just have to get used to being outside for a little while longer. Your turn: Ever take a picture with your phone or smartphone that made you go, "Whoa"? Do tell - or even drop a link to it in a comment. My poor dumb phone (don't feel bad for me, I actually prefer one) takes terrible pictures. I'll just admire this one of yours, thank you very much! Take 50 photos and hope one is what your eye saw. I have found that lighting can be just magical at times and I can regret not have a camera. Aren't you glad you carried yours? Before I tead your write up Carmi I assumed you had used all the right gear for this photo & I was greatly surprised to read that it was a phone camera shot. It came out marvelously.